Hello! This is Preston House; the local owner of the Papa John’s pizza stores her in the Tri-Cities! I moved to the Tri-Cities with my family over 7 years ago to take over the local Papa John’s pizza stores. It didn’t take us long to realize that the Tri-Cities would not only be an excellent place to raise our family, but also an excellent community to do business in. Even more than that, I knew that I really wanted to use our business as a tool to help make a difference in the community, and that is exactly what we have been trying to do ever since by giving back, one pizza at a time! Over the years we have had countless opportunities to be a part of and give back to our community. We’ve partnered up with schools across the region, attended many community events. Worked with local charities, shelters, food banks and other non-profit organizations. We have also been able to grow and expand from two Papa John’s locations to four; which has allowed us to provide more and more jobs. But, none of this would have been possible without all the support our customers have given us! As we have tried to help support the community we have been overwhelmingly supported back and our pizza family thanks you! We want to show you our appreciation as well as encourage you to spend some time with your family and friends. This time of year, we know there can be a lot going on with what seems like very little time to spare, but we also think it is important to spend quality, distraction free time with the ones we love. In my own family, I see how easy it can be to get caught up in the demands of life and the many obligations. I also see my three growing kids before my eyes and I am not always sure where the time has gone! One way that my wife and I have found to help get that quality time in is to have a weekly tradition with our kids where we set aside time every Saturday for uninterrupted game time. What is the perfect addition to family game night? Pizza of course! We take the stress out of worrying about what’s for dinner, so you can worry about what matters most. That’s why we are offering a special deal now through the end of the year. 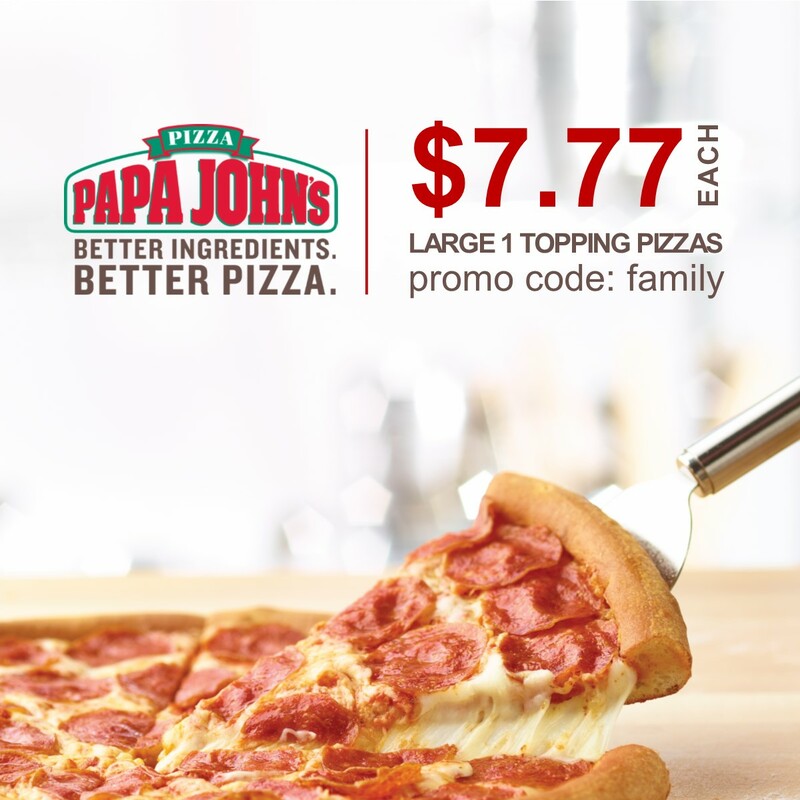 Right now, get large one-topping pizzas for only $7.77 each! That’s right just $7.77 each! So tonight, why not make it a pizza and game night. We’ll make dinner, you make the memories!